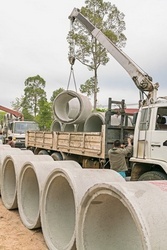 Pacific Clay Products makes concrete pipes. Pacific Clay Products tells its driver, Mr. Wambolt, to deliver a load of concrete pipes to Ace Plumbing & Heating in Las Vegas, Nevada. When Mr. Wambolt arrives in Las Vegas, he needs a forklift to unload the pipes. Lucky for Wambolt, Ace Plumbing & Heating has a forklift available. Ace rented it from A-1 Inland Rentals. Sadly for Wambolt, the forklift is defective. The forklift seat is broken causing Wamblot injury. Wambolt sues A-1 Inland Rentals and Ace Plumbing & Heating hoping to recover for his injuries. A-1 Inland Rental has its own insurance through Industrial Indemnity. Industrial Indemnity is an additional insured on the Commercial Auto Policy issued by Fidelity-Phenix insurance to Pacific Clay Products, Mr. Wambolt’s employer. Industrial Indemnity thinks that Fidelity-Phenix’s Commercial Auto Policy should cover its insured A-1 Inland Rental. Industrial Indemnity argues that the omnibus clause and the loading and unloading clause of Commercial Auto Policy. When Wambolt files suit, Industrial Indemnity tenders the defense of its insured A-1 Inland to Fidelity-Phenix. Fidelity-Phenix rejects the tender. Industrial Indemnity files a declaratory judgment action seeking to force Fidelity-Phenix to take up the defense. Fidelity-Phenix files a Motion for Summary Judgment arguing that because Wambolt was the employee of its insured Pacific Clay Products, the employee exclusion precluded coverage under the Commercial Auto Policy. The trial court agrees with Fidelity-Phenix that the employee exclusion is enforceable and thus the Commercial Auto policy does not cover A-1 Inland Rental. Then Industrial Indemnity appeals the summary judgment. The Nevada Supreme Court considers the arguments of the parties in Industrial Indemnity Co. v. Fidelity-Phenix Ins. Co., 83 Nev. 260, 428 P.2d 200 (1967). On appeal, Industrial Indemnity argues that the coverage should exist because as an additional insured, driver Wambolt is not ITS employee. It argues that since Pacific Clay Products is not a party, then Fidelity-Phenix cannot claim the benefit of the employee exclusion. However, the Nevada Supreme Court rejects that argument. It says that if Mr. Wambolt’s employer, Pacific Clay Products been a defendant, there would have been no coverage. The court explains that the outcome should be no different, no matter who the named defendants might be. If you have questions about insurance coverage in Nevada or about an employee exclusion, please do not hesitate to call Mike Mills at Bauman Loewe Witt & Maxwell at 702.240.6060 x114 or email him at mmills@blwmlawfirm.com. He will be glad to speak with you about your coverage issue.